I worked on the Little Blue painting for about 2 hrs. Here is the first step. 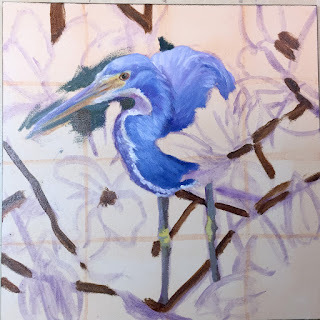 I wanted to be sure that I didn't muddy up the color of the bird so I painted it first with a combination of dioxazine purple, ultramarine, thalo blue, and titanium white. Mostly Gamblin colors. I added a little chromatic black to the chest area. I had to stop to make dinner. 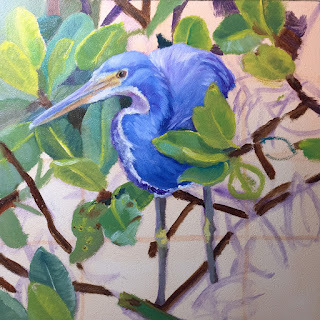 The next steps involve painting the mangrove leaves. I have spent another 2hrs. on the brightest ones. I used the same colors plus cadmium lemon. That's enough for today.